The Parrot's Nest is the perfect spot - close enough to Oneroa to be able to walk into the village for your morning coffee and croissant, but very private and peaceful. Sit and enjoy a glass of wine in the lush native garden after a busy day at the beach! The Parrot's Nest is set over 3 floors. Entrance is onto the middle floor, which has the kitchen and living, along with the large master bedroom and bathroom. The living room has a cosy wood burner, making it perfect in the winter. Downstairs are a further 2 bedrooms, along with a second bathroom. These open out on the lawn. 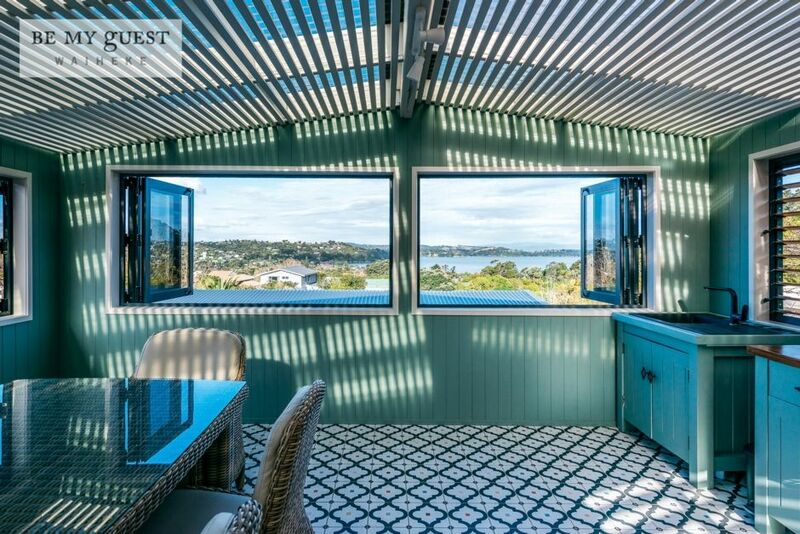 Upstairs from the living level, and accessed via a spiral staircase outside the front door, is a fabulous dining room, with shutters that open the whole way round, and fabulous views across Oneroa and out the bays on each side. It gets great sun and also has a gas fire. There is a sink, fridge and prep area, along with the Weber BBQ, so this is the perfect area for a long leisurely meal, enjoying some fine Waiheke wines! There is also a TV up here giving great flexibility for the kids and adults. This outstanding location is only 2 mins drive from Matiatia Ferry Terminal and an easy 10min stroll to the vibrant village of Oneroa with plenty of great cafes, bars and shops. Wander along Church Bay Rd to Cable Bay winery, with its fine wine and even better views! At the bottom of the garden is another property, The Treehouse, which is also available for rental, talk to us if you have a larger group and would like to rent both properties together. All bookings incur a one time linen and exit cleaning cost of $180 so you have nothing to do but relax, refresh and enjoy. Be My Guest are a locally owned & operated property management company. Be My Guest properties are Waiheke's top short term rental accommodations. Every care is taken to make sure each home is presented to the highest standard. We provide detailed information about the property & the island, and our team are on call throughout your stay. The perfect base for a family holiday on Waiheke Island - close enough to Oneroa to be able to walk into the village for your morning coffee & croissant, but very private & peaceful. Sit & enjoy a glass of wine in the lush native garden after a busy day at the beach! Very close to award winning wineries, and great beaches. A wonderful property, very well maintained, everything you needed and clean. A wonderful property, very well maintained, everything you needed and clean. The view is wonderful, master bedroom is generous. Lovely linen. The top room was a fantastic space for a family BBQ. Would definitely stay again. So glad to hear you enjoyed your family time in that special spot! Great location. Quirky and fun entertainment space upstairs. Fabulous property - I have already recommended to friends and family! Fabulous property - I have already recommended to friends and family! Great set up, facilities, location and very friendly contact with owners. We'll be back! Located in a very friendly residential neighbourhood, close to Oneroa Village, but walking distance to farmland & wineries. Cable Bay and Mudbrick wineries are further along the road and make for a very pleasant afternoon of wine tasting! Further afield are lots of other great beaches & wineries, award winning restaurants & a golf course!